Girls Ballerina Jewelry Box | Great Gifts, Buy Online! This selection of girls ballerina jewelry boxes features beautifully detailed designs outside with a ballerina dancing to music inside. Our laminated boxes are constructed of hardboard with durable laser paper overlays featuring ballet recital, dance class, ice skating, fairy and big sister-little sister illustrations. A girls ballerina music box with spinning ballerina will surprise and delight your little dancer! Add a brass engraved nameplate to any of these styles for personalization. 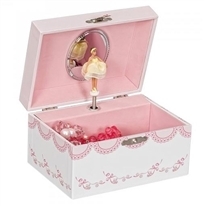 Our girls ballerina jewelry boxes are manufactured by trusted brands. Choose a Mele ballerina jewelry box, Enchantmints ballerina music box or MK Designs ballet box and it will become a treasured keepsake for years to come. This selection features music boxes with illustrated laser paper overlays featuring ballet recital, dance and fairy themes. These music by styles offer detailed designs and quality construction without the price tag of a hand painted or solid wood design. They offer whimsical scenes that will delight your little dancer. All ballerina jewelry boxes with ballerina qualify for free shipping over $50, easy returns and product warranties. Let us know by phone or email if we can help you with your selection.